Move over, William and Kate! You aren't the only royals who celebrated a wedding: the handsome Prince Dashington and lovely Princess Snowcup had their own fairytale wedding on the very same day! Dashington and Snowcup are the rulers of the adorable Zhu Zhu Princess line, and although they certainly don't need any help in melting kids' hearts, royal weddings don't magically appear all on their own -- so MomSelect invited me to host a Royal Wedding Playdate to help the happy couple plan their fairy tale wedding. To help us out, MomSelect sent us a Magical Princess Castle, Magical Crystal Ballroom, Magical Princess Carriage, Enchanted Princess Outfit, Enchanted Dragon Outfit and of course, Prince Dashington and Princess Snowcup. 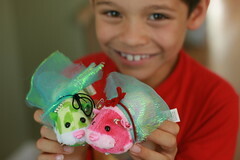 The Pea brought her best friend, her brothers and a gazillion yards of tulle, organza, ribbons and beads. Together, they created a wedding fit for a princess! 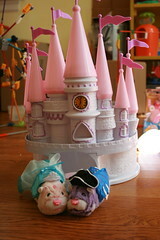 The Magical Princess Castle is the perfect backdrop for the Official Royal Wedding Photo. The pink turrets look really adorable (only from the front; alas, on the other side they are hollow, and were clearly meant to be the back, even though the kids will spend most of their time playing on that side) and the Royal Outfits are soooo cute. Only someone as dashing as Prince Dashington could pull off the tricorn hat look in the 21st century! 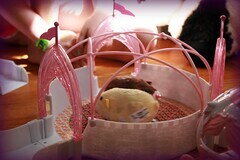 The Magical Crystal Ballroom snaps onto the Magical Princess Castle (or onto any playset in the Zhu Zhu Pet line). This playset is different from any of the other round Zhu Zhu playsets I've seen, because Zhu Zhu Pets don't just scurry around it, or through it. There's actually a little "merry-go-round" contraption in the middle of it so you can place two Zhu Zhu pets on it and watch them dance! The pink "crystal" doors and pink flags and pink trellis make it even more special. 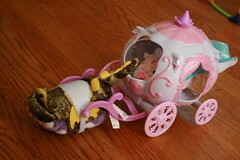 I can't think of any girly-girl who wouldn't want both playsets for her Zhu Zhu pets. 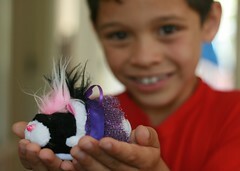 As usual, the best part for me was seeing how Zhu Zhu Pets brought out the kids' creative side. They really went to town creating outfits for all the royal guests. Lady Harlow and Lady Bitsy came in matching iridiscent dresses and beaded earrings. Countess Roxie didn't need jewelry to draw attention to her face; her shocking pink mohawk took care of that! Her outfit was expertly designed (and glued together) by yours truly, at 3Po's request. Princess Beatrice, eat your heart out! You're not the only one with a penchant for shocking hats (or is that a fascinator?). The Pea's best friend gave Lady Pipsqueak a headgear so fabulous and so fitting to her color, all I can say is.... bongga. With everyone dressed and ready to go, The Pea and her friend proceeded to film the entire wedding. I won't post everything all at once (every good fairy tale needs a bit of suspense), but here is the first installment for you. Any similarities to the story of a girl named Cinderella are purely coincidental. Or not. Prince William found his princess, but will Prince Dashington be so lucky? 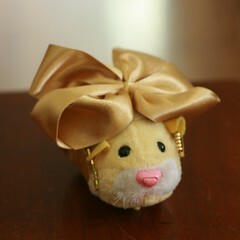 Stay tuned for further installments of The Pea and her friends' reinterpretation of Cinderella, ZhuZhu Princess style!